Top-Rated SellerInspiredCreations consistently earns high ratings from buyers thanks to fast shipping and excellent service. Premium SellerInspiredCreations has been a Platinum member on Bonanza since April 10, 2017. If you are not 100% satisfied with your purchase, simply contact us and send it back within 14 days in the same condition you received it, in the original packaging and we’ll provide a refund. Promotion packages are not eligible for returns. 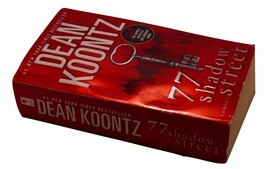 77 Shadow Street by Dean Koontz The Pendleton stands on the summit of Shadow Hill at the highest point of an old heartland city, a Gilded Age palace built in the late 1800s as a tycoon’s dream home. Almost from the beginning, its grandeur has been scarred by episodes of madness, suicide, mass murder, and whispers of things far worse. But since its rechristening in the 1970s as a luxury apartment building, the Pendleton has been at peace. For its fortunate residents?a successful songwriter and her young son, a disgraced ex-senator, a widowed attorney, and a driven money manager among them?the Pendleton’s magnificent quarters are a sanctuary, its dark past all but forgotten. But now inexplicable shadows caper across walls, security cameras relay impossible images, phantom voices mutter in strange tongues, not-quite-human figures lurk in the basement, elevators plunge into unknown depths. With each passing hour, a terrifying certainty grows: Whatever drove the Pendleton’s past occupants to their unspeakable fates is at work again. Soon, all those within its boundaries will be engulfed by a deadly tide from which few have escaped.